Arms and ammunition in Colombia are used by different end users such as military, law enforcement, and civilian. Ammunition in the civilian market has gained importance owing to the growing demand in self-defence, hunting, and shooting applications. 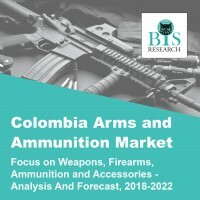 Additionally, the rising tension between Colombia and neighbouring countries calls for tightening the security at the country’s borders due to which a steep climb is expected in arms and ammunition market during the forecast period (2018-2022).